We have written several tutorial and how to articles for the Amcrest HDPro and Amcrest HDSeries home security cameras. Excellent hardware with some of the most unfriendly user software around. You need to have some advanced IT knowledge to use these. Tutorials on how to do a lot of stuff aren’t easy to find. So that’s why we are writing this easy to follow tutorial on how to setup email on an Amcrest HDPro or HDSeries camera. Both camera models use the same web interface so when we refer to the HDPro in this article, it also applies to the HDSeries. Before we get started, if unfamiliar with some of these camera models, be sure to read our review of the Amcrest HDPro. Now on most mainstream home security cameras, you sign up for an account and then this is all taken care of behind the scenes. In the case of Amcrest, all the email setup is done by the owner including communicating with your email provider’s servers. Other manufacturers like Nest will generate these alerts from their own servers. Why do you need to setup email on an Amcrest HDPro or HDSeries Camera? To receive alerts. There are two types of alerts that be generated off these cameras. The first is an alert on your phone. The second type alert is email. You can’t get email alerts without going through these steps. These cameras permit multiple email alerts to be sent. So in theory, these alerts can go to a distribution list of people. So let’s discuss how to setup email on an Amcrest HDPro or HDSeries camera. Amcrest will have you interface with a service called Simple Mail Transfer Protocol, also known as SMTP. This is what will be used to communicate with your provider’s email servers. This is easiest accomplished using the Amcrest web app from a laptop or desktop computer. Assuming you are already logged into your Amcrest camera, click on the setup button at the upper right of your screen. From here, click on Network then SMTP (email). There are several fields to complete. A photo of what this will all look like when done accompanies this article. The first field to fill in is the SMTP server name. 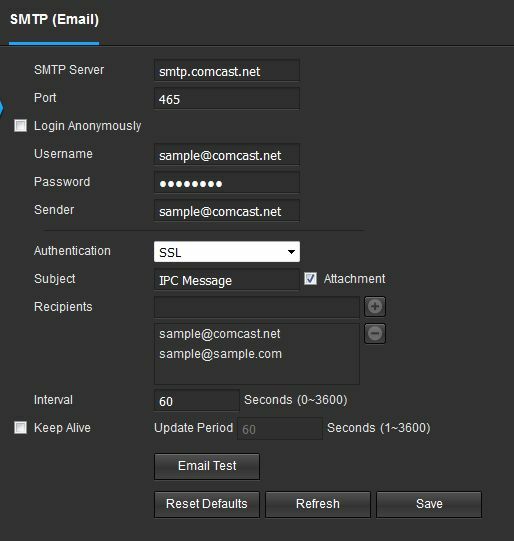 I happen to be using Comcast for sending my email and if you are as well, just enter what you see in the photo as that is the name of Comcast’s SMTP server. If using gmail, enter SMTP server name “smtp.gmail.com”. If you are using a different email provider, you should be able to find the server name with a simple search. If using a corporate server (and you probably shouldn’t be if this is for personal use), this likely will not work as the connection is protected with security protocols beyond the scope of this article. The next field to complete is the port number which will typically be 465 with SSL encryption or 567 with TLS encryption. These are the common port numbers used. Next enter your username, password and the sender which is your email address. These are the logon credentials for your email address. For obvious reasons, I changed my email address to the name “sample”. Next, select the type of encryption used. In my case, I use SSL and that’s what is selected. The subject field can be anything you like. I chose to keep the default of IPC Message. I should probably change that. Be sure to check the Attachment box. That’s what tells your camera to include a photo of the action that kicked off the email alert. Now setup the recipients. Enter the email address where you want to receive notifications here. Remember to click the + icon to add it to the recipients list or they will not become effective. You can enter multiple email addresses. The interval box is the amount of time between email alerts. I used 60 seconds and it gets fairly overwhelming when there is continuous motion. Like when someone is home. I suggest something higher than 60 seconds, perhaps 300. I didn’t need to set a keep alive value but if necessary you can add an interval which tells your email server that you are still around. The default is 60 seconds and that should be good for most providers. Now press the Email Test button. If this is all setup properly, you will see an acknowledgement at the bottom of your screen. Your recipients will also get an acknowledgement email. Email is now all setup. You can now check the Email box when setting up Event Alarms. Be sure to follow our article on How to Eliminate False Motion Alerts on an Amcrest HDPro to save some additional time on that activity. Hopefully this tutorial helped those needing assistance to setup email on an Amcrest HDPro or HDSeries camera. It took me some trial and error to get this all straight. Following what is outlined here should save you some time.